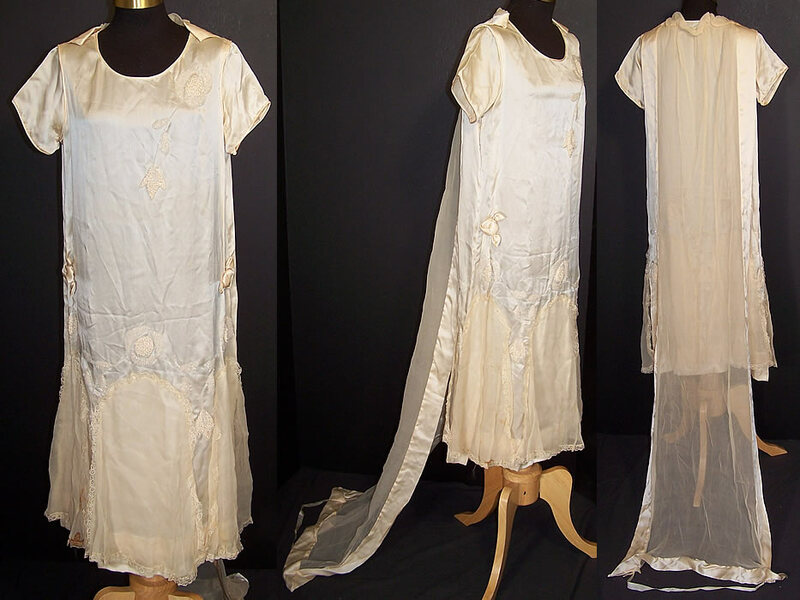 This vintage cream silk beaded rosette wedding dress watteau train gown dates from the 1920s. 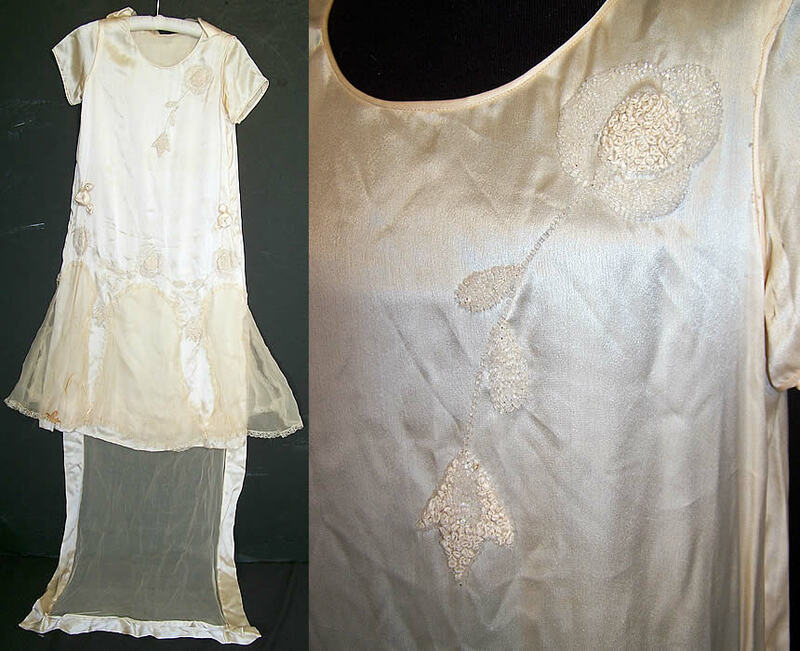 It is made of an off white cream color silk fabric, with white beaded flowers and raised French knot embroidery work accents. There are cream silk rosette rosebud flower trim sewn onto the sides. 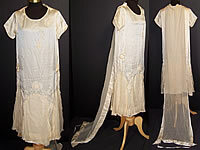 This beautiful bridal wedding gown dress has a loose fitting drop waist style, with a rounded scoop neckline, short sleeves, a sheer chiffon, lace trim panel short overskirt and long sheer chiffon silk border trim watteau train falling from the shoulders in a draping cape style back train, with ribbon loop at the bottom for carrying. The dress measures 43 inches long, with a 67 inch long back train, 38 inch hips, a 36 inch waist and 38 inch bust. It is in good wearable condition, with some faint discoloration and fraying under the arms. The sleeves could be cut off and removed leaving the dress sleeveless and wearable. 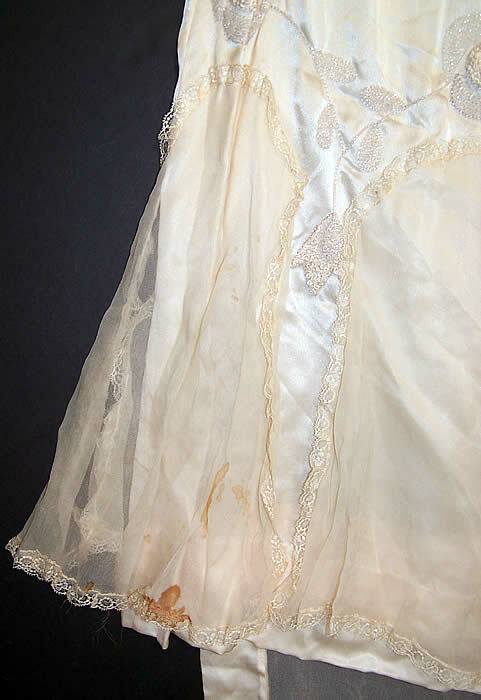 There are a few age spot stains on the chiffon side skirt panel (see close-up). This is truly a rare wonderful piece of antique wedding textile art.